I make these images by first carving a design into a wood plate, then I pack that plate with gunpowder and place it in my custom built printing press. 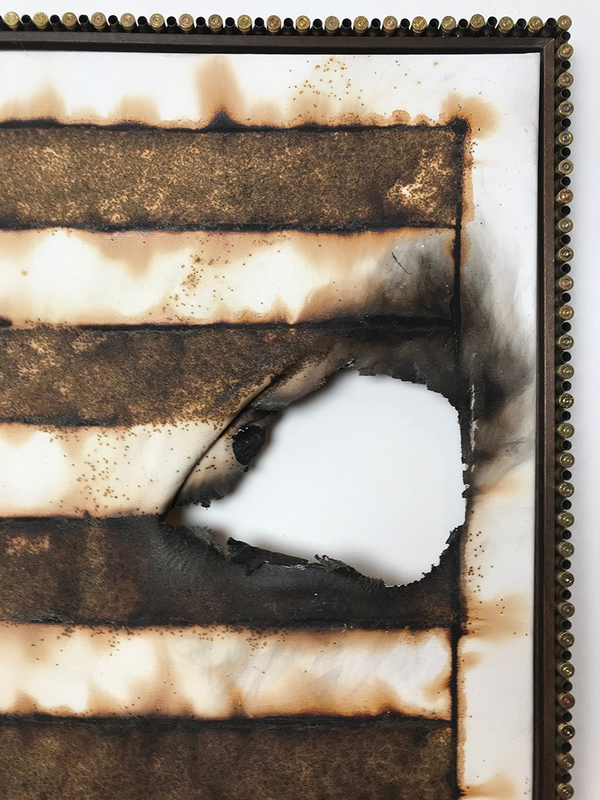 After igniting the gunpowder, I press a canvas down onto the plate which detonates the gunpowder into the canvas to create the image. I choose the powder that is used by a particular firearm to create each of these pieces. Contemporary firearms utilize what is known as “Smokeless Powder.” This powder comes in a wide range of options, for pistols, rifles, shotguns, etc. Each of these powders has a distinct granule shape (sphere, disk, tube, etc.) texture and color. They also have quite different burn profiles, which result in different visual outcomes. The smell of the sulfur and the delicate texture of the burnt canvas are designed to create a bridge between the viewer and the historical moment represented. 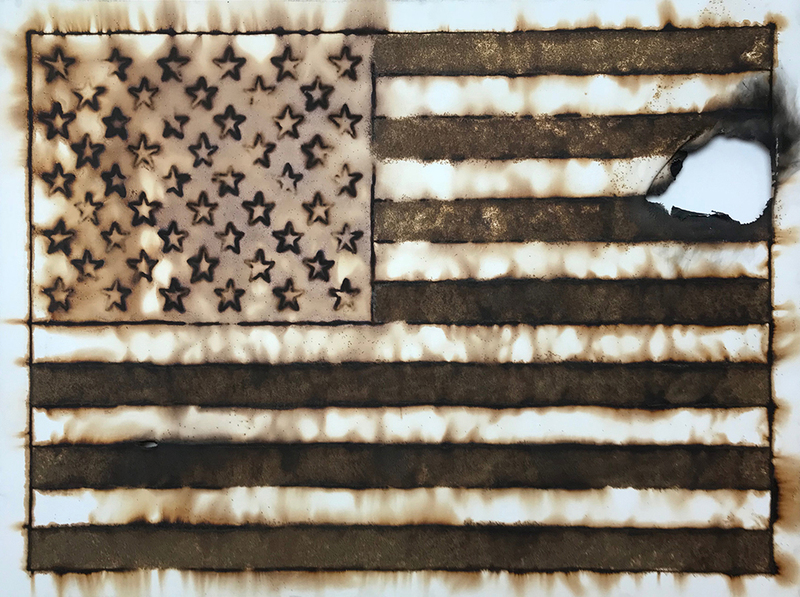 Tattered Glory, 2017, gunpowder print on canvas, 36 x 48 in. Printed by detonating Hodgdon H322 Smokeless Powder into canvas. This gunpowder is found in .223 caliber ammunition for the AR-15 assault rifle, which stands at the center of the debate about gun ownership in the United States as it is currently legal to own this weapon, a firearm designed for the military with the sole intent of murdering human beings. Conversely, this weapon is also revered as a primary instrument for the protection of the United States and it’s freedoms in foreign conflicts. 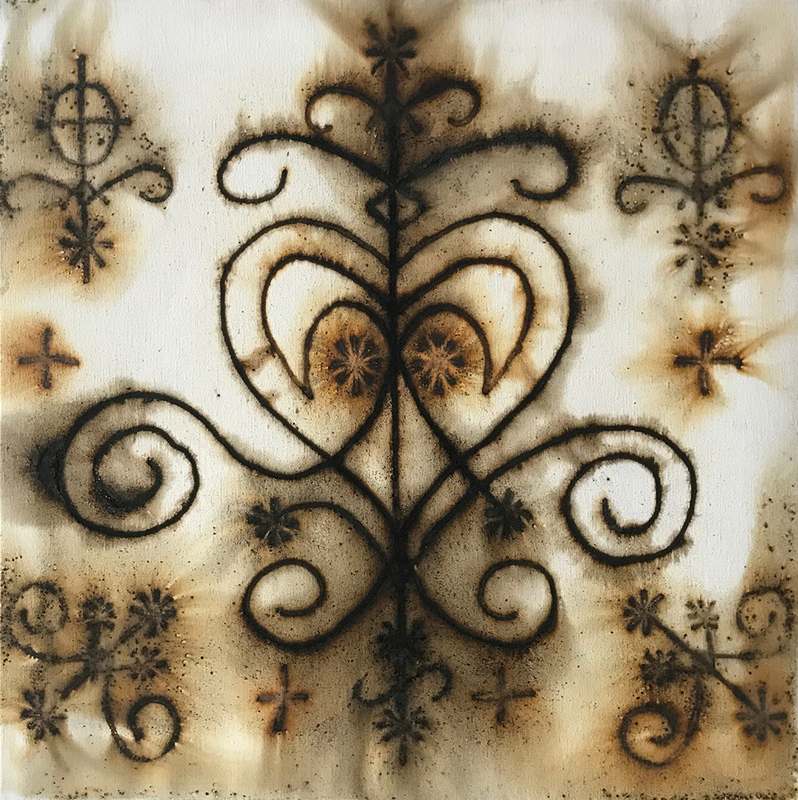 The Veve of Madame Corazon, 2017, gunpowder print on canvas, 20 x 20 in. A Veve is a representation of a Voodoo spirit, or Loa. In this case, it is a representation of an aspect of Madame Corazon, a member of the Family Ghede. This piece is created with my personal recipe of black powder, smokeless powder and ground sage. This alchemical combination both charges the image and purifies the line. The visual representation of spiritual beings is a complex subject. The Quran, for instance, forbids visual representation of the Prophet and the second commandment of the Old Testament is against images of the sacred. But Voodoo thrives on abstract representations of spirits as a means of connection to them. Visitors Welcome, 2016, gunpowder print on canvas. 36 x 36 in. The incident was the deadliest mass shooting at a high school or grade school in U.S. history. 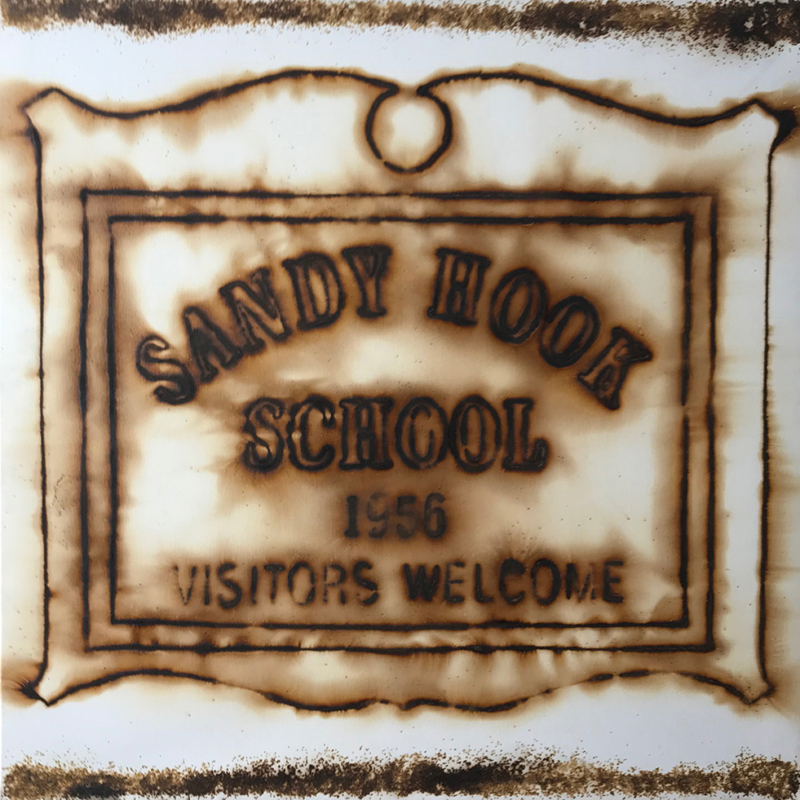 I ask that you take a moment to consider the notion that in 1956, when the school was founded, visitors were welcome in schools such as Sandy Hook. 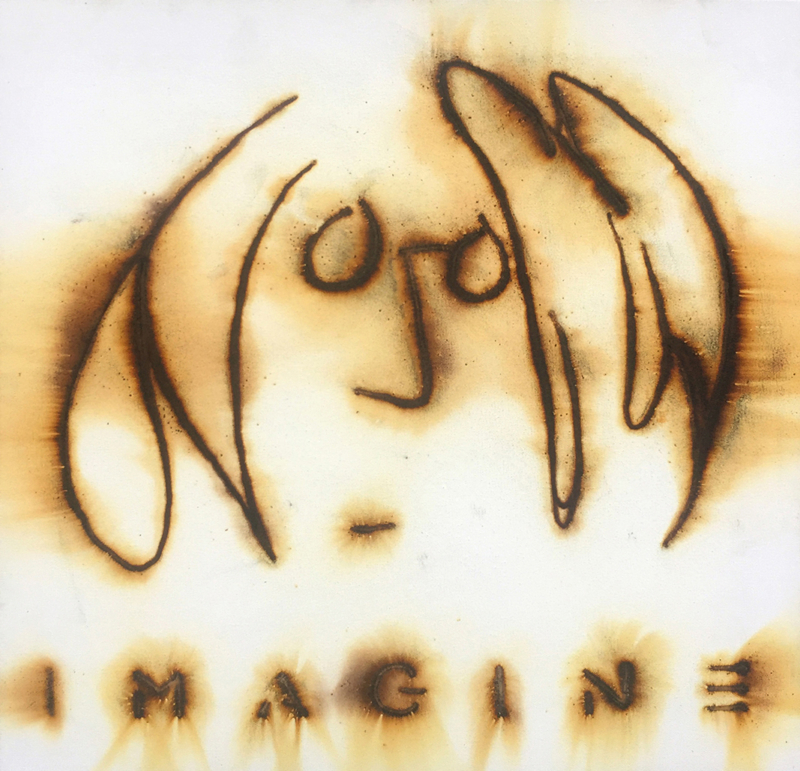 Imagine, 2016, gunpowder print on canvas, 20 x 20 in. Printed by detonating Hodgdon HP-38 Smokeless Powder into canvas. This gunpowder is found in .38 caliber handgun rounds for the Charter Arms .38 Special revolver used by Mark David Chapman on Monday, December 8, 1980 in New York City.